Forecast: Confidentially looks like a standout in this maiden miler for older fillies and mare that originally was scheduled for turf. The daughter of Tapit is improving with each outing and most recently missed by head-bob against similar foes at nine furlongs. This shortened trip shouldn’t be an issue, and we’re expecting the Shirreffs-trained filly to be along in time at odds shorter than her 8/5 morning line. Forecast: Beantown Boys was a voided claim when finishing second in a slightly softer affair at Los Alamitos in early December but has trained especially well since – he made our “Primed and Ready” list (see video) following a sharp drill in 1:00 flat Jan. 22 – and if he can handle the off track he’ll be hard to beat. Maldonado should have him within striking range throughout. Impression is at his best on the front end and if not pressured early could take this field a very long way. In a sign of confidence, he’s being double-jumped in class by Morey and is another that has appeared quite sharp in morning drills since winning gate-to-wire in late December. We’ll prefer Beantown Boys slightly on top but use both in our rolling exotics. Forecast: ​Calm Down Lady shows up in a maiden claimer today and should greatly appreciate the class relief. She has plenty of zip – as displayed in her first two outings when facing straight maiden foes – and at this level could easily roll all the way to the wire. Gadot adds Lasix and can improve with the return to this maiden $50,000 level. She didn’t display any early speed in first two career outings but should picking up tired rivals in the final furlong. She’s worth using on a ticket or two, but the main punch goes to Calm Down Lady. Forecast: Anuket was a very impressive debut winner for Baffert in late December, has trained well since, and should be a very short price again while tackling winners and stretching out to a distance that she’s bred to love. She’s 6/5 on the morning line but seems certain to leave at odds-on. While otherwise passing the race, we can use her as a no value rolling exotic single. Forecast: Bizwhacks stretches out again while trying to earn her diploma in her eighth career start. Finally, it looks like she’s found a field she can beat and will probably do so in gate-to-wire fashion, assuming she handles the wet surface. Mercy Mercy returns to the main track – her best form has been on grass – but if she maintains her form she should be the most dangerous of the closing types. You use her as a back-up or a saver. Forecast: ​This race originally was carded for the Hillside course. It’s definitely a spread in rolling exotic play; as of this writing scratched are unknown but there should be many. Unicorn (see our Black Book segment) flashed ability when finishing strongly but too late in a recent Hillside turf sprint for maiden 3-year-old fillies. If she can transfer that ability to a sloppy/wet fast main track, she’ll be hard to beat, but that’s a big if. Shes All Woman is bred to like an off track and displayed some ability last summer when competing on dirt. She should be running on late. Also-eligible Posit, third in the same race Unicorn exits, will be on the pace and could stick around a long time if she takes to the wet surface. Another also-eligible, Twice Golden, flashed speed in a very strong maiden sprint won by Anuket in her debut and is likely to benefit greatly from the outing. She’ll be a price and is worth including in your rolling exotics. Forecast: I Am the Danger keeps getting faster on numbers and seems capable winning again despite being raised from starter’s allowance to the first condition. The son of Adios Charlie has plenty of speed but doesn’t need the lead to win, and bug boy Figueroa fits him well. Soul Streit was last seen finishing fifth in the Del Mar Futurity back in the summer of 2017, but he was very impressive winning his debut so we know he can fire fresh. The works should have him plenty fit for a barn that hits at an amazing 38% with layoff runners. Clyde’s Pride won a state-bred allowance affair last month with a good number and should be competitive on the raise. Rosario stays aboard for Hollendorfer. Preference on top goes to I Am the Danger, but we’ll include all three in our rolling exotics. Forecast: We’re not sure if Nero really wants to stay a middle distance but if he’s ever going to get the trip it will be in his first try. The son of Pioneerof the Nile drops from the Grade One Malibu Stakes to this second-level allowance affair and most likely will try gate-to-wire tactics. The off track shouldn’t be an issue. Surfing Star was scratched out of a similar event last month, so this will be his first outing since a very impressive entry-level allowance win in early November. Rosario takes over and should have this Surf Cat colt in striking range throughout. Popular Kid earned a big figure when beating first-level foes over this track and distance last month. This clearly is a tougher spot, but the hard-hitting veteran is a winner of seven career starts, five of them at Santa Anta, and also has shown the ability to win on an off track. 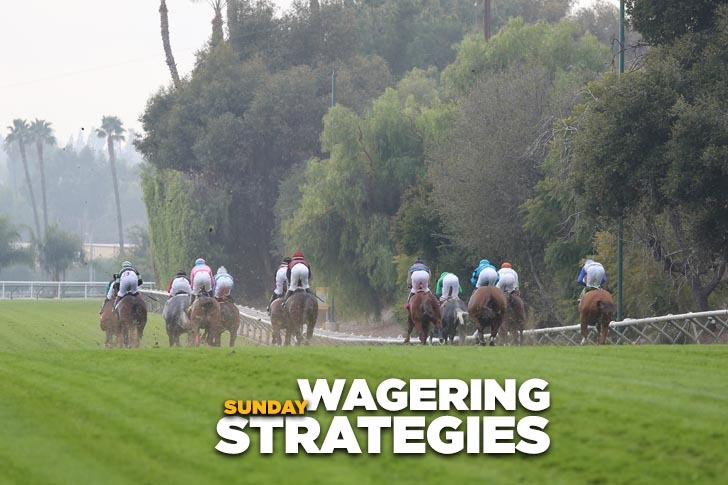 Forecast: Lanacakes won a maiden $20,000 claiming sprint at Los Alamitos in mid-December with a number that makes her a fit at this restricted (nw-2) $12,500 level for fillies and mares. She’s only had two starts, so she may more upside than most of the others don’t. Lucky Lula, away since July, returns in a logical spot and has trained reasonably well for this class of filly. In a soft race she should be competitive. Jeweled is re-equipped with blinkers while dropping below her claim level. First or second in six of 11 career starts, she can be counted on for another good effort. These are the three we’ll prefer, but anything goes at this level over a wet track, so we suggest you use as many as you can afford to.